Those who don't drink coffee may not quite understand the need to map out coffee shops while on vacation. But, just know it’s important to your fellow coffee-drinking travelers. From the first pick-me-up cup of the day to a relaxing mug after a delicious dinner, drinking coffee is an experience that involves all the senses. If you’re planning a trip to the Yosemite National Park, you’ll be excited to know there are several wonderful spots to stop on your tour. Take a look at our tips for the best places to visit for your Yosemite coffee fix. An amazing place to get that first cup of the day is right here at Hotel Charlotte. After a good night’s rest, wake up to enjoy a delicious breakfast and Yosemite coffee before you head out for the day. Download our free Vacation Guide and keep it handy as you travel to see our suggestions things to see and do in the Yosemite area. Hotel Charlotte sits at the entryway to the beautiful Yosemite National Park. When you set out to explore, there is so much to see including giant Sequoias and breathtaking waterfalls. As always, please be sure to check local resources regarding road closures before you begin your trek into the park. The following list highlights a few Yosemite coffee shops at various destinations throughout the park. If you're looking for a delightful coffee shop, Mountain Sage offers incredible service and is a favorite stop after a long day of activities. Take a bite into a delicious homemade baked good or sip on speciality lates and tasty tea's. This is a great place to stop for a little energy if you plan to be hiking in the Half Dome area. Coffee Corner offers fresh pastries and any number of your favorite coffee drinks, including cappuccino, espresso, and the classic cup of coffee. This shop is open seasonally from March through November. As you travel east through the park, Lee Vining is a fantastic place to spend a few hours in Yosemite. We recommend that you plan to visit Mono Lake Tufa State Natural Reserve to view the tufa towers. These towers look like spires and knobs and they are made of calcium-carbonate formed by the interaction of freshwater springs and alkaline lake water. Be sure to stop by Mono Cup Coffee, which is open seasonally and located in the heart of town. Grab a cup of fresh-brewed coffee or espresso and sit outside to enjoy the scenery. While Black Velvet Coffee is a bit further afield in Mammoth Lakes, you still might find yourself there as you explore the area. There are many interesting things to see in that area, including Devils Postpile National Monument. This area is also popular for skiing in the winter months. Black Velvet Coffee serves organic, Rainforest Alliance micro lot fair trade and direct trade coffees. Each batch is roasted on site with great care. Visit the Espresso Bar for a rich, satisfying cup of coffee, an array of specialty drinks, or even beer and wine. If you decide to enter the park through the south entrance near Mariposa, stop by the Pony Expresso coffee shop during your travels. The focus for Pony Expresso is on using organic, single origin coffee roasted in small batches daily. The company prefers single-origin (from family-run farms when possible) because no pesticides, fertilizers, or growth stimulants are ever used in production. After careful hand sorting, the beans are then hand-roasted on-site and then ultimately brewed and poured into a cup for your enjoyment. When you visit the coffee shop, you'll find the decor eclectic, the coffee delicious and the food satisfying. 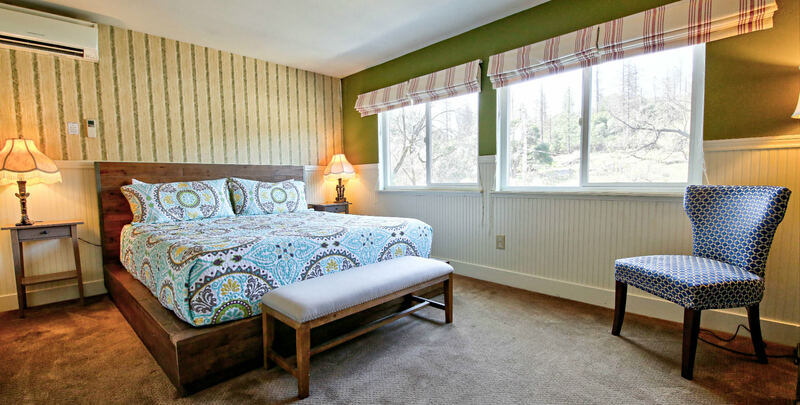 If you’re looking for the best Groveland, CA, hotels during your California getaway, Hotel Charlotte is the ideal selection for its location, lodging, and amenities! Not only does our wonderful bed and breakfast contain luxurious rooms and the divine Fork and Love Restaurant, but we also have several vacation rentals you can stay in as well. Each morning includes a delicious breakfast and, if you choose, a piping hot cup of coffee. You’ll love the comfortable and relaxing environment we have to offer, as well as the numerous nearby attractions and activities. Don’t wait a moment longer; check our availability, view our specials and packages, and start planning your dream vacation to Groveland, CA!